Working within the travel industry, particularly involved in weddings and honeymoons is perceived as a glamorous job... it can be, but it also is extremely hard work! 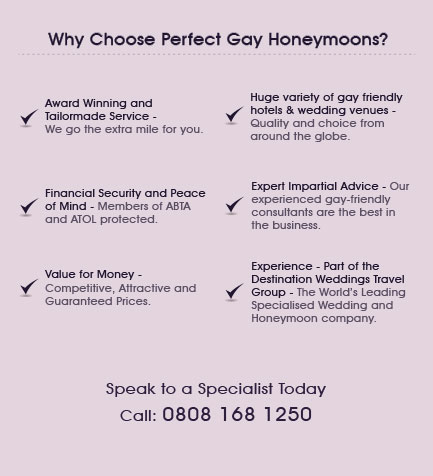 If you have the right attitude and work ethic it takes to be involved in a fast paced and busy environment then working for Perfect Gay Honeymoons might be right for you. We have a number of different options from our main office in Lichfield, Staffordshire in Sales and Administration. Or if you are located elsewhere in the UK but have the relevant experience you could become a Weddings Abroad & Honeymoons Specialist based in your own home office. Or if you have little or no experience but are keen to get in to the industry, or if you own a bridal shop, wedding planning business or other wedding industry company then you could join our Ambassador Scheme - where you generate us the leads, we do the hard work for you and you earn unlimited amounts. Click below for more information. Our main Business Support Centre is located in Lichfield, Staffordshire. Supporting our brides and groom's and our homeworking team across the UK. If you have a minimum of 5 years experience in the travel industry, we'd love to hear from you. You could become a Wedding & Honeymoon Specialist. Little or No Experience? Own a Bridal Shop? A UK-based Wedding Planner? If the answer is yes to any of the above ur Ambassador Scheme could be right up your street.